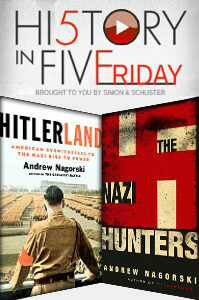 June 10, 2016 – It’s History in Five Friday, presented by Simon & Schuster. Check them out at Facebook.com/HistoryInFive. Today, award-winning journalist and author Andrew Nagorski casts a fresh look back at the great evil of Nazi Germany, in his critically acclaimed Hitlerland , and now on shelves: The Nazi Hunters . How do we deal with the legacy of everyday Germans, who turned to monstrous acts? What do we owe to the World War Two generation and Holocaust survivors as they pass away? And what were the conflicts in vision among those who hunted Nazi war criminals themselves as they conducted their searches?